Meet beautiful Summer. 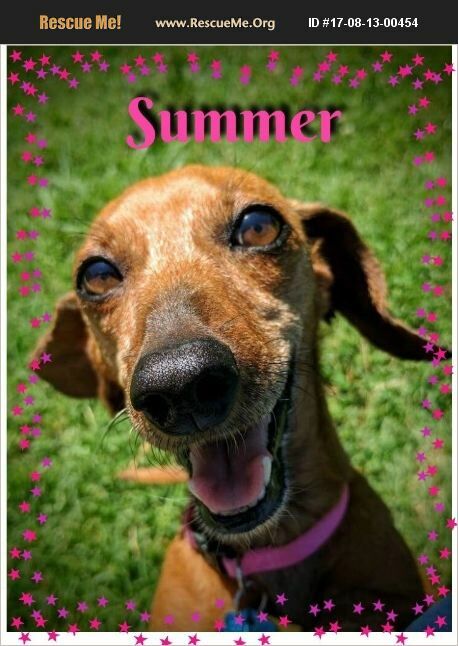 Summer is a happy healthy young senior girl. We are unsure of Summer's age having been originally told that she was 14 when she came into our rescue. Summer is younger than 14 and we believer her age to be somewhere between 8 - 10 years of age. Summer is a teeny tiny girl of only 10 pounds who is a super cuddle bug! Summer gets along well with children, other dogs and kitties too! She does very well on a leash and seems to do well in a car as well. Summer is a submissive little girl who loves to be cuddled and hugged. She loves to sleep on your lap and sleeps in the big bed in her foster home in Alabama. Summer would like a home where she could continue to enjoy the love that comes from sleeping in the big bed. Summer is crate trained and house trained but like all dachshunds she will need to be confident in her environment to have good potty habits. All rescue dogs go thru a period of adjustment so understanding and patience is important. Summer is waiting patiently for her forever home. Are you the lucky one to share her love?